Harriet Seaward, aged 10, from Moreton-in-Marsh, Gloucestershire was recently announced as the winner of a bundle of great prizes in a competition run by Topz magazine and Friends and Heroes. To win the competition Harriet had to correctly answer a series of questions about the story of Ruth from the Old Testament. Her entry was chosen from a multitude of entries received from across the globe. Harriet's Prize: A portable DVD Player of her own plus DVDs. Harriet also received a personalised framed photgraph of herself amongst various Friends and Heroes characters! Our exciting new competition aims to encourage children to read the Bible, providing a timely response to a recent shock survey highlighting widespread ignorance among children and parents about the contents of the Bible. We want your children to record themselves reading one or more of a selection of passages from the Bible, either on their own or in groups, and to creatively bring the passages to life by adding appropriate sound effects. 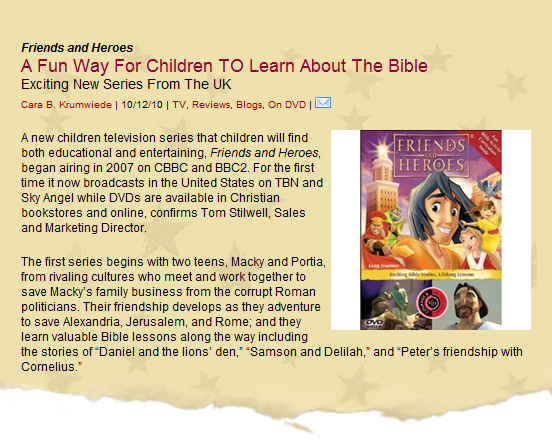 The best versions of each story will be featured on our Friends and Heroes children's website www.friendsandheroes.tv and will receive a special prize. Both the BBC and leading national newspapers have reported on a recent poll, conducted by the Bible Society, which reveals more than a third of young people are unaware that stories such David and Goliath, The Good Samaritan, or the story of Jesus come from the Bible. Surprisingly 60% had never even heard of Jonah and the Whale and many thought the recent film "The Hunger Games" was actually a story from the Bible, emphasising the real ignorance about what the Bible contains. 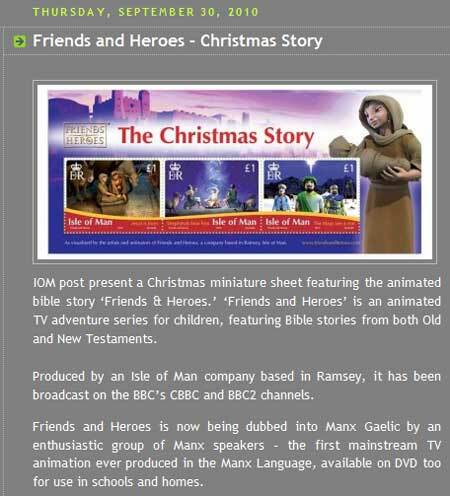 The new Manx version of the award -winning TV/DVD series Friends and Heroes was celebrated at the annual Yn Chruinnaght festival held on the Isle of Man (20th July 2013). The production is the first of its kind, being both the first Manx language cartoon and a great community project, involving amateur voice-over actors recruited from the Manx Gaelic speaking community across the island. To see a short video of the occasion and the background to Caarjyn as Fenee (Friends and Heroes) see the video below. 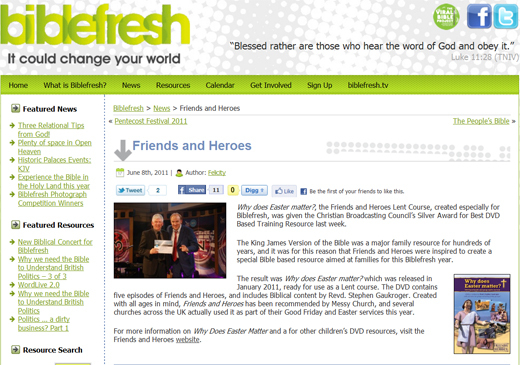 At the CBC awards, Friends and Heroes won Silver for Why does Easter matter?. You can read more about the award itself on our News page. We were delighted to read Sarah Reinhard's review of our Music CD What about Love? 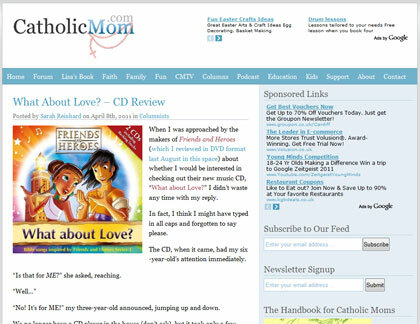 : Bible Songs inspired by Friends and Heroes Series 1 on catholicmom.com! She was obviously impressed concluding: "As a mom who all-too-often struggles with the catechesis side of my job, I love that these songs make my six-year-old ask for specifics about Bible stories. As a mom who all-too-often opts to read the fun story instead of the Bible story, I love that these songs tell those stories in a memorable and non-annoying way. As a mom who all-too-often just lets the kids watch a movie in the van, I love that this CD gives me an opportunity to sing along with them without losing my sanity. To the folks at Friends and Heroes, I say: THANK YOU. To you, I say: BUY THIS." This was a surprise but stamps are collected all around the world! 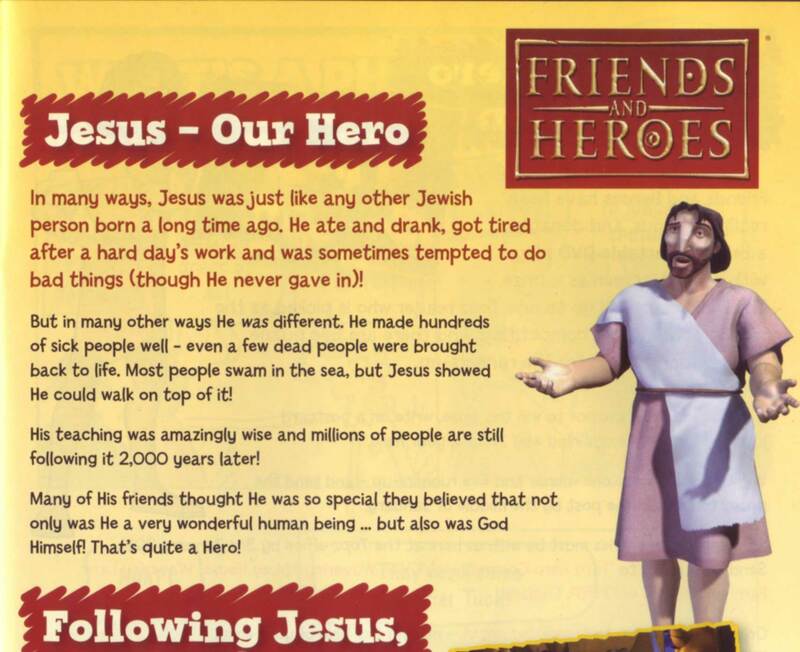 Topz, the CWR Bible reading magazine for 7-11 years olds, follows the theme of 'Jesus our Hero' on 21st November 2010 and so Friends and Heroes was asked to design a page about Jesus and to provide a great competition. You can see one of the pages below but you'll have to buy a copy to enter the competition for a Friends and Heroes DVD Player!